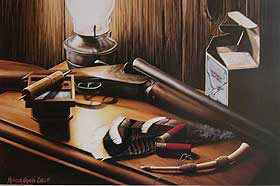 Melissa has been using turkey feathers as her canvas for 20 years. Each feather is entirely hand painted with acrylic paint. Visit the samples page to see the wide variety of sizes and subjects. In addition to painting on feathers, Melissa is also a print artist. Her focus on the wild turkey has led her to a long standing relationship with the National Wild Turkey Federation. 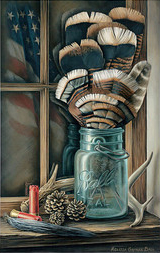 Melissa won the NWTF’s Grand National Art Contest in 2001, and has since had a painting featured in their national core package more than ten times. During that time, Melissa was named the NWTF’s Featured Artist of the Year in 2003, and Stamp Print Artist in 2005, and again currently in 2017 with “Echo in the Oaks”. Find a banquet near you at www.nwtf.org.